We already knew it but now it has been confirmed! Kitty Miller Bay was recently judged as Victoria’s best secret beach by a panel of Parks Victoria employees. Why this beautiful horseshoe-shaped bay is “secret” is a mystery as it has lots to offer. But that makes it more enjoyable for those of us in the know. Often there are so few visitors you can have the whole beach to yourself. It is a great swimming spot, especially at mid-tide when you can walk out quite a way on the rock shelf. I have even had small stingrays swim past! It’s a great beach combing place for children – from interesting seaweeds to shells to shark egg cases – there is a lot to pique their interest in the natural world. For the surfer there is a nice break which has a dedicated following of local surfers. 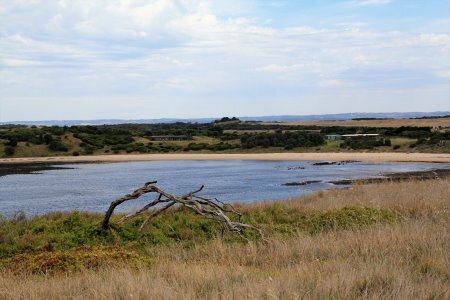 If you are interested in the science side of things, walk around to the west to the rock shelf, where there are many signs of the volcanic origins of Phillip Island. 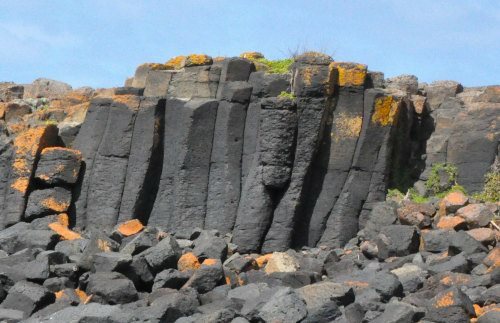 See where layers of lava from volcanic eruptions have cooled into hexagonal columns. Further around to the west there are lava dykes on the rock shelf – now exposed by erosion. The softer surrounding rock has been cut away leaving just the low wall of the dyke. If you want to see these volcanic dykes, visit at low tide. To top things off Kitty Miller Bay has its own shipwreck, the SS Speke. Walk around to your left from the car park. There is a narrow track around the top of the rocky shoreline, or climb over the boulders for a more direct route around the base of the small promontory. It’s better to visit the wreck at low tide. A three masted steel ship of 2,876 tons and 93 metres, and built in Wales in 1891, the SS Speke drifted broadside on to the reef on 22 February 1906, while en route from Peru to Geelong, via Sydney, to pick up a cargo of wheat. The accident was blamed on faulty navigation by the captain. Little of the Speke was salvaged and heavy seas caused it to break in two and rapidly disintegrate. 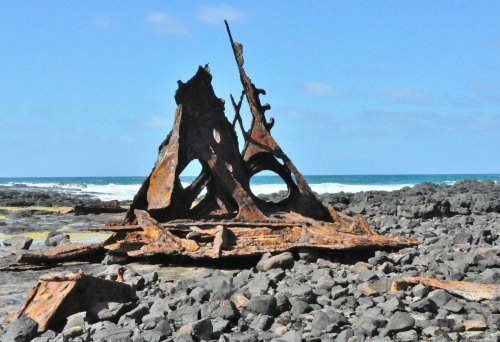 Wreckage from the Speke, including part of the bow, lies on the rock shelf, and also scattered in shallow water along the edge of the reef. The compass box, part of the figurehead and other items from the wreck are displayed at the Phillip Island Historical Museum, while the ship’s bell is at the Uniting Church in Cowes. Many times I’ve walked past Asian Kitchen in Cowes but knowing that most Asian sauces contain gluten, I haven’t stopped in. However, to cater for coeliacs, Asian Kitchen has its own AK special sweet soy sauce blend. Although it’s a quiet Saturday night on Phillip Island, most of the tables are filled. Because we have made a reservation, we are seated in one of the booths with a window onto Thompson Avenue. 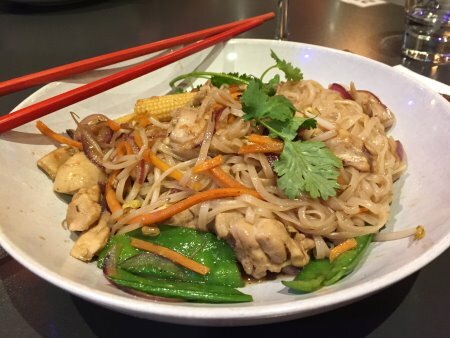 Not wanting to spend time searching through the menu, I go the easy route and order char kway teow - chicken and vegetable stir fry with rice noodles. If preferred, diners can choose their own ingredients to make their favourite dish. With winter closing in I was looking for a hearty meal and this one delivers - a big serving of delicious, fragrant food. Top off your meal with Australian wines or choose from the selection of beers from various Asian countries. 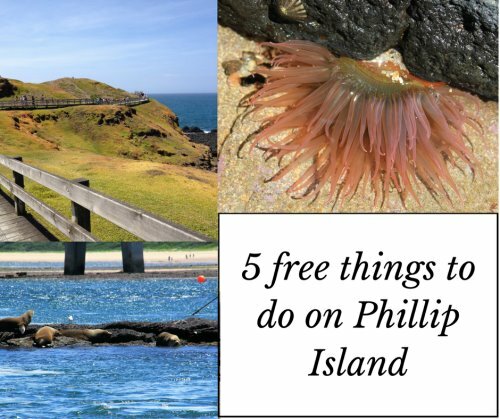 While a lot of Phillip Island’s attractions have an entry fee, there are still a few things visitors can do to make the most of their island stay without having to dip into the wallet. I’ve listed 5 here but there are more. How about the daily pelican feeding at San Remo (technically not Phillip Island but hey! )?